The girledworld World of Work Summit 2018 at RMIT University on 16 and 17 June puts female tech trailblazers in contact with teenage girls. Which is just what girls in secondary school need to become the start-up trailblazers, business leaders and government heads of tomorrow. Madeleine Grummet, co-founder and CEO, of girledworld, realised first-hand the necessity of co-founding girledworld in 2016 because “girls can’t be what they can’t see”. Her start-up builds the next generation of female entrepreneurs, innovators and science, technology, engineering and maths (STEM) skill leaders with Edtech (education technology), interactive events and life-changing career mentoring. The girledworld World of Work (WOW) Summit seeks to bust stereotypes. Can you share some insight into that? When girls see women in leadership as scientists, doctors or other roles typically dominated by men, it expands their options and gives them permission to pursue these roles. Girls encounter representations about who and what they should be on TV shows, movies, the news and on social media platforms including Facebook, Instagram and Snapchat. These representations, combined with desired role model attributes, are influential in shaping girls’ identity, goals and career aspirations. The summit centres on ‘real world learning’. Can you tell us more? Real world learning means girls getting access to globally relevant, real world problems to solve, and learning from real world people. The WOW Summit is more than just inspiration; it’s about giving girls what they need to step into their futures eyes wide open. This year’s summit focuses on the ‘World of Work’ and immerses girls in real-world problem-solving, enterprise skill-building at Melbourne’s RMIT University city campus across one big weekend of hands-on learning. It’s a transformative, exciting opportunity for secondary school girls to shape their thinking, goal set for tertiary pathways, explore their passions and connect with outstanding global industry role models, business leaders and career mentors. They’ll explore emerging technologies, STEM, the future of work and use design thinking to tackle the biggest global challenges. The summit is all about empowering, equipping and educating the next generation of girls with the skillsets, mindsets and techsets they’ll need to lead, succeed and thrive in ever-changing, technology-dominated 21st century workplaces. Going deeper, why is real world learning such a game-changer for girls? Girls need real-world learning and working opportunities to inform their future career planning. Many young people don’t know what career pathways exist, particularly across emerging STEM and startup sectors, and they need access to better knowledge to make informed tertiary, TAFE or trade decisions – especially when they’re disadvantaged by geography, life circumstance or social-economic factors. University of Melbourne interns working with us have been researching role models and what they found is that role models seem to be especially important for those under-represented or stigmatised – they open out frames of reference and allow girls to consider alternative potential career pathways, and instil confidence to explore interests beyond norms. Was there a light bulb moment when you made the decision to co-found girledworld? 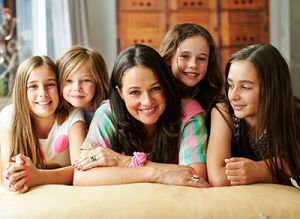 As a mum to four girls, gender is big on my agenda. It’s time the world changed. I co-founded girledworld with fellow student Edwina Kolomanski while studying a full-time Master of Entrepreneurship at the University of Melbourne’s Wade Institute. We were trying to solve a problem for ourselves: the gender gap, the empty STEM pipeline and lack of women in leadership positions in the businesses and boardrooms across the world. Our primary Masters thesis was mapping attrition rates of women out of the workforce in a rapidly changing world, and seeking to understand how we change this. To build a new generation of female founders, leaders and STEM champions. We’re growing fast. We need to. The number of women in boardrooms, political offices, corporate leadership positions and funded startups still isn’t moving fast enough. But at girledworld our theory is to get into the pipeline early and give girls the skillsets, mindsets and techsets they need to survive and thrive in the future of work. We need more women, and the girls after them, standing up, stepping up and establishing the startups that will create the new economy, policy and jobs of Australia’s future. Given the relentless rise and rise of technology, what do girls need to thrive in the future job market? Access to a diverse global community of visible female role models. There’s a great saying: “do as I do, not as I say”. It’s about action, not advocacy. We’re building a global role model and World of Work platform with partners to give girls access to the stories, skills, startups and micro-credentials they’ll need to lead and succeed in their future careers. What are the future-facing skillsets girls need? The world is shifting – technology, automation and digital are opening out whole new value chains, efficiencies and marketplaces and, as a result, the traditional workforce is being disrupted rapidly. Given the uncertain and rapidly changing face of the global workforce, girls need to develop liquid skills (also referred to as 21st century and soft skill-sets). These are transferable skills that will be critical in the future of work, and go beyond that of ‘technical’ skillsets to include teamwork, digital literacy, design thinking, communication, creativity and problem-solving. Think of them as complex human skills honed in the real world. The problem is, our industrial-age education model is not moving fast enough to keep up and equip girls with these real-world skills. “When girls see women as scientists, doctors or other roles typically dominated by men, it expands their options and gives them permission to pursue these roles.” – Madeleine Grummet. You argue that innovation stagnation is a major trap for Australia. In what way? Australia is slipping on the innovation index, despite the fact that we’re relying on an innovation generation to drive the new market. Recent Australian Bureau of Statistics data shows a continued decline in the teenage labour market… so if they’re not out there building skills in the rapidly changing world of work, how are they going to get them? We need to get better at facilitating meaningful work experience opportunities for young women. We need industries to embrace reverse mentorship, and recognise that skills are built by doing. The next generation will have up to 17 jobs across five different careers (according to the Foundation of Young Australians) which means we’re going to see a nation of portfolio freelancers competing in a fractured, hyper-competitive global marketplace where transferrable 21st century skills will be the valuable hiring and trading currency. We see this already in places like Silicon Valley. It’s clear jobs for life will be gone. Girls need to be ready for this new way, and world, of work. Why do we need more investment in future-facing career education? We’re living in a new age, the Knowledge Age, an age of creativity, of ideas, of collaborative consumption, blockchain, drones, clones, artificial intelligence and of exponential technologies redefining an open global marketplace. The world has changed and so must our education system – we need to invest more in preparing young people earlier for what’s coming. This means investing more time into building bridges between education, industry and government. Madeleine Grummet holds a University of Melbourne Master of Entrepreneurship (First Class Honours), Monash University Bachelor of Arts (Hons), Journalism Cadetship Herald Sun News Limited, Swinburne University Master of Strategic Philanthropy and GrantMaking (Equity Trustees Experiential Giving Unit), IDEO Design Thinking Certification and Inventium Innovation Facilitation Certification.